could (interrupt handling) be added to the existing MCP23017 module? This conversation is about exploring the options of that. As first thing I made a deep dive into the current MCP12017.sjs I2C module and built a test bed - wiring and code - as a solid regression base for adding things and not breaking things (the current code though already breaks things a bit by its different naming... mainly to support my thought process), but that can be reversed. 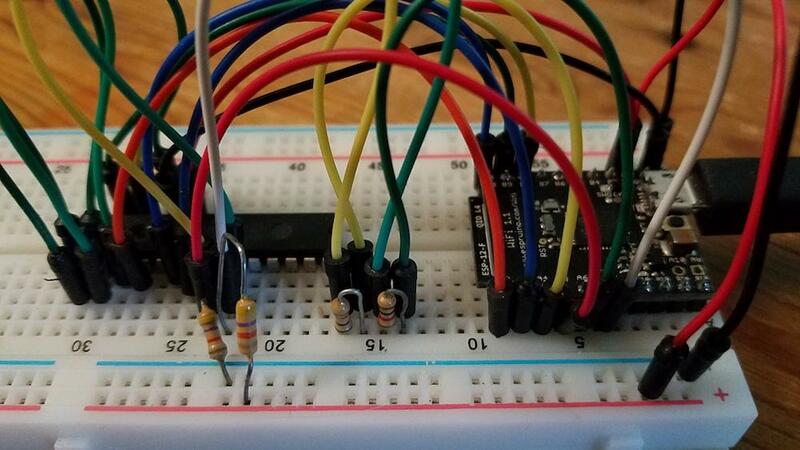 The breadboard setup is shown in attached screen shot. T## identify Tests, S## identify Setups. Setups are small pieces of code that configure and re/set the ports. They are combined to build a complete setup as part of a test. Could the setWatch be given a simple (compiled - for speed) callback in the options? That callback would in this case just read the interrupt relevant registers and pass them - as object - to the existing interrupt handling. The handling would then stick it with the usual information into the JS event/interrupt queue? In other words: provide a hook for the application to contribute to the event payload... by extending the existing option with a custom interrupt handler function property. The existing Espruino interrupt handling would - in addition what it already does - invoke the function and stick its return value/object with the other stuff in the JS event/interrupt queue and deliver it as payload to the setWatch callback. and other code anyway already does... because it hogs the single and only processor / execution tread). I do not know the struct of the Js event/interrupt queue entries, but I'm sure that it can hold a reference to an object... This object would then include all what is needed as payload when invoking the setWatch callback. (If it is just one object, then this object would include the current information plus the reference to the additional object. I appreciate if it also includes the setWatch handle and the options object, because it comes handy for the application in the setWatch callback (no extra - globals / variables would then have to hang around). If you're executing an arbitrary JS function for the interrupt itself then surely there's no need to use the setWatch event queue? You could just emit an event, or do any number of other things. It's worse than that - the interpreter wasn't designed for reentrancy. While I'm allocating variables in IRQs for the nRF52, it's something I'm actually considering taking out. The issue is that occasionally the interpreter will have to do a GC pass - and it'll do that outside of an IRQ. During that time, any IRQs that fires won't be able to allocate variables. But all this seems needlessly complicated - if Espruino isn't too busy, any function supplied to setWatch should execute almost immediately anyway - despite running outside of an IRQ. I also conclude that the process is to complex and variable to be implemented without memory resources that are exposed to potential GC. invoke .setWatch() method on passed the extender pin and pass the callback and options object. hold on to passed portextender pin object in the internal watch object (for any clearWatch() down the line). invoke .clearWatch() method on the held-on portextender pin object(s - plural, when clearWatch is called without arguments). ONLY return the passed portextender pin object reference as the watch ID (rather than just an integer number) and nothin else. With the alternative, Espruino has to store nothing about the watch. Non-built-in, portextender pins trigger the redirect of the argument(s) for both .setWatch() and .clearWatch(). For alternative it works also that the portextender object is passed rather than a pin. The portextender object has then to understand .setWatch() and .clearWatch, which could set interrupts for groups of pins. The implementations can even go that far, that .setWatch() can return any custom object deemed useful in the watch life cycle, as long as built-in clearWatch() can detect that passed in 'pin' object is not a built-in pin. I think holding on to a reference to the pin could be a bit painful - however your idea of setWatch passing the object back through sounds absolutely perfect, and pretty easy to implement. When I have a free moment I'll have a go at implementing it. That's cool - thank you. In the meantime I use a setWatchX / clearWatchX as stand-in for the respective future implementations. It allows me moving on with the exploration. To fix up the existing setWatch implementation to how you want it. Any modules should then use your new setWatch. ...yes, but I didn't want to get into the business of having to determine whether the passed pin is a 'real' / built-in pin or an 'imaginary' / portexpander pin... when I can get it 'for free' from you... ;)... last but not least also because typeof 'built-in pin' does NOT return something like "Pin". Of course, I can go after all the other things, but that makes it not universal (built-in Pin class would be a 'reserved word') and, takes away the option to turn just any thing in any fashion into a watchable... (variation of object.on("<eventName>",callback)). Alternative to have a working typeof <built-in pin> could be an extension of E like E.isE(spruino)Pin(<object>). ;):.something else I'd like to get for free... and may get so ;? ...or is it already 'there', and I just don't know about it? I think x instanceof Pin will work? Although perhaps checking "object"==typeof x is better? Instanceof does work. I would advice against typeof because its not precise enough. @PaddeK and @Gordon, thank you for the input. If require() has the same issue, could you 'fix' that too? ...I'm milling around the require() as from require.js (requireJS.org - as it works in the browser) to make AMDs available on Espruino (via communication connection). Detection of alternative implementation is by number of arguments > 1). ... did not share the code I used... let me do it in the state when I hit the wall with the spike caused by Espriuno pin mode change. It is now - 1v95 - fixed. Did not have the time to resume... :( ...yet... :]. Note the rewrite of the rewrite of the MCP23017 module... with the new name MCP23017i2c16w - MCP2317 in i2c 16 bit (default) mode and w atch-able interrupts. ,m // mode of Pin: ""output"|input"|"input_pullup"
//     test functions to be invoked from console. Is it useable as it is? It is certainly cool to use signaling from external chips. @barbiani, yes, it should work now. - There was an issue I ran into: the pin mode change produced a spike that erroneously triggered an interrupt. This was mended w/ release of 1v95 as I recall. @barbiani, upadted post #15 with some more comments and consistent namings.